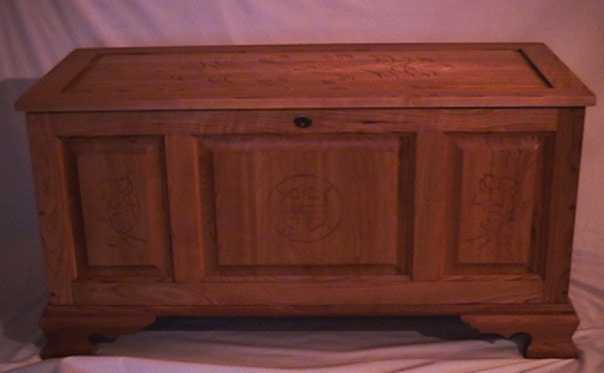 This cedar hope chest was custom made with special hand carved panels for Elizabeth. She chose Cherry and Aromatic Cedar from our list of woods for this special Heirloom Chest. 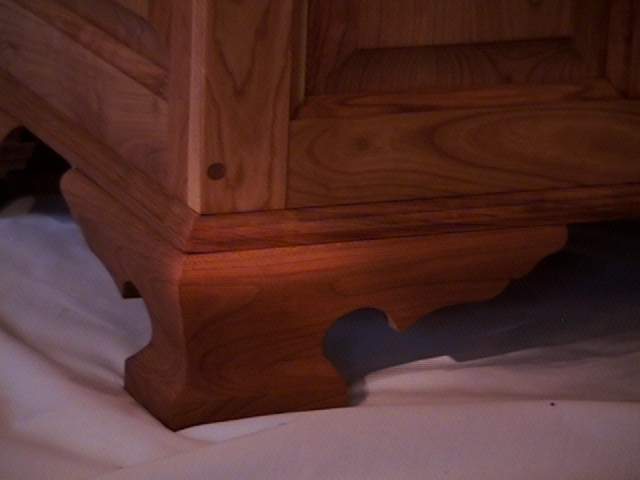 It is in her own style with a Cherry lid and scroll feet. This hope chest is our Quilt size and measures 42 inches wide 19 inches deep and 22 inches high. This chest includes a half full tray of solid Aromatic Cedar, as well as a lock. For Elizabeth with our best wishes! Elizabeth chose our single frame lid. This cedar hope chest, her own design, reflects class and thoughtfulness, and rests upon scroll feet. The single frame lid, molded base trim, and scroll feet provide an artistic balance, pleasing to the eye. truly make this hope chest a Family Heirloom with a personal touch. The Chinese symbol for long life appears on panels of this hope chest. 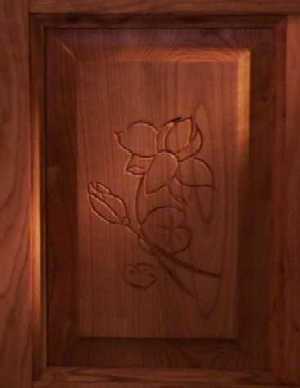 Two lotus flowers mirror each other on the lid carvings. Scroll feet elegantly provide a solid foundation to support family keepsakes. Elizabeth chose the lock option for her Heirloom. The class of the Antique Escutcheon lock speaks of precious family treasures safely kept within. 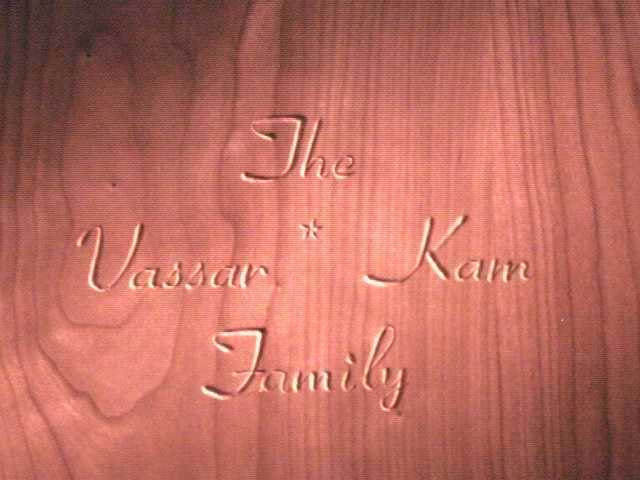 Carved, personalized script truly makes this a Family Heirloom, and Treasure. Elizabeth selected options from our main directory. She also provided us with personal requests, which truly made this an Heirloom to be Treasured. Visit our in stock page ~ a cedar hope chest waits for you. 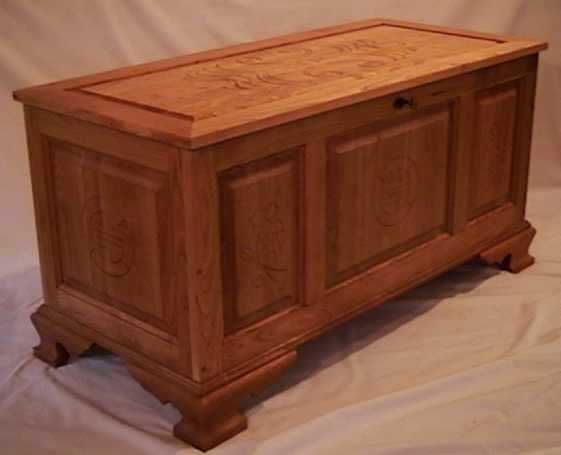 View our main directory to see what you can choose for your own handcrafted, custom cedar chest. We'd love to craft one for you and your loved ones.